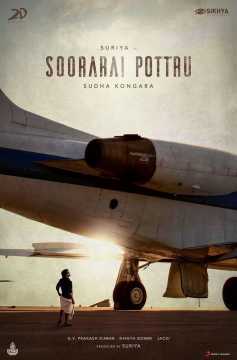 Suriya 38, the highly anticipated project of actor Suriya and filmmaker Sudha Kongara, has been officially titled Soorarai Pottru. The makers also unveiled the title look poster on Saturday, the eve of Tamil New Year. Earlier this week, the project was officially launched in the presence of the film’s cast and crew. The launch ceremony was also attended by Suriya’s father Sivakumar, wife Jyothika and brother Karthi. Malayalam actress Aparna Balamurali, last seen on screen in Rajiv Menon’s Sarvam Thaalamayam (2019), has been finalised as the leading lady. The rest of the cast is yet to be revealed. Well-known producer Guneet Monga, who recently won the Academy Award for short film Period. End of Sentence., will be foraying into the Tamil market with this project. She’s co-producing the project with Suriya’s production house 2D Entertainment. In her recent interview to daily The Hindu, she revealed that the film will be based on the life of Captain GR Gopinath, the founder of budget airline Air Deccan. It has to be seen what Monga’s association means to the project. Is there a possibility that the film could also be simultaneously shot in Hindi and Monga will take care of its release? We have to wait to get more clarity on this matter. GV Prakash Kumar has already been signed to compose the music. Prakash had recently revealed that he has already completed composing songs for the film, which will be simultaneously shot and released in Telugu.